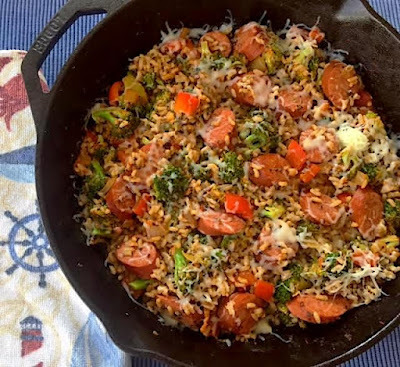 This savory skillet dish is just too easy not to make... over and over again! The perfect ingredients for a scrumptious meal! Heat olive oil in a large skillet over medium-high heat. Add garlic and onions and sauté for 2 minutes, until onions become translucent. Add kielbasa and cook until it's lightly browned on both sides. Add red pepper, broccoli, chicken broth, and tomato sauce. Let simmer 10 minutes until the vegetables are tender. Stir in cooked rice and cheese. Serve and enjoy! If you'd like a printer-friendly version of this recipe, Click Here.